Heat the cheese and milk in double boiler until melted and smooth. Add the remaining ingredients and continue to cook, stirring occasionally, for 20 minutes. Put mixture in a blender and blend until smooth. 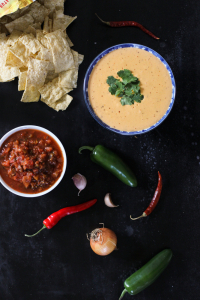 Place Con Queso in a bowl and serve with your favorite chips or vegetable strips.